Heckler & Koch (HK) took the internet by storm earlier this year with the introduction of their newest pistol, the striker fired VP9. Even though at that point I had never owned an HK pistol, I was immediately interested in the VP9 for a few reasons. First, unlike the rest of the current HK pistol lineup, the VP9 is striker fired, which I much prefer over other trigger mechanisms. I’ve shot an HK P30 in DA/SA configuration, and while I think it’s a great gun, I just don’t care for the DA/SA trigger system. I liked the LEM version of the P30 better, but not enough to get me to give up Glock. The second biggest reason I was interested in the VP9 is the price point. HK has a well-earned reputation of being expensive, but the VP9 breaks this mold somewhat with an MSRP of $719, and a street price of around $600. That puts the VP9 in the same ballpark price range as Glock, M&P, PPQ, etc. For these reasons, I decided to give HK a try. I’ve had the VP9 for a few months now, and in bottom line up front fashion, this gun is fantastic. If you’re in a hurry but are considering purchasing the VP9, the short version is go ahead and buy it, I think you’ll love it. You’d be hard pressed to walk into your local gun shop and find a better out of the box striker fired pistol. Here’s why. First things first, some basic measurements. Experience gained by HK engineers with the recent P30 pistol had a direct influence on the design of the VP9, but the VP9 breaks new ground with its integration of a unique striker firing system with an enhanced HK â€œlight pullâ€ trigger. The net result is trigger quality unequaled in any production striker fired handgun. That description is pretty spot on in my opinion. The trigger pull weight is advertised at 5.4 lbs, which is right in line with my VP9. Of the striker fired pistols I own and have shot, the VP9 trigger is most similar to the also excellent PPQ trigger. Picking which is better is really splitting hairs, but if you forced me to choose between the VP9 and PPQ, I’d probably go with the VP9. But really, both are fantastic, and Glock and Smith & Wesson should take notice. 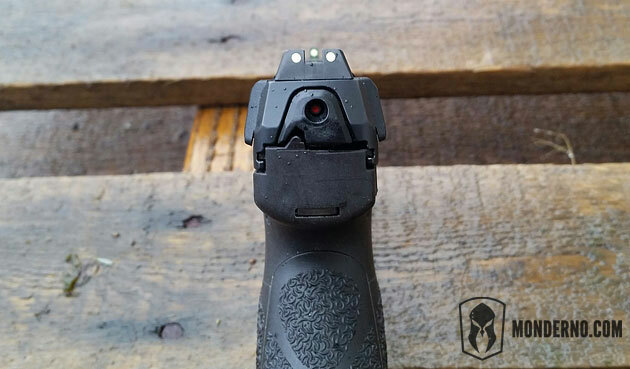 Another feature unique to the VP9 are the patented HK charging supports. When I first read about the charging supports, I thought they were pretty gimmicky, but after using the VP9, I no longer think so because they do actually work in that they give you something to grab on to when manipulating the slide. I don’t care much about them either way, but if you don’t have good hand strength, you’ll probably really appreciate this unique feature. The VP9 ergonomics are another selling point – the gun feels great in hand, points naturally, and the grip is user customizable. There’s really not much to report here – change out the included grip panels to customize the feel and grip circumference to what works for you. The ergonomics again are most similar to the PPQ, that is to say, fantastic. Lefties rejoice, because the VP9 is a fully ambidextrous design, with a slide catch/release and paddle style magazine release on either side of the pistol, and has nice front and rear slide serrations. The VP9 comes with two well-made 15 round steel mags, and it takes P30 magazines which can be found online without too much trouble. Stock up while you can. The sights are non-radioactive luminous (glow in the dark) three-dot variety that are adjustable for both windage and elevation. They aren’t bad, but they aren’t great either. I’m not a huge fan of night sights, but these don’t really even qualify as night sights in my opinion. The idea behind glow in the dark sights is simple: you’re carrying in a low light situation and you’re presented with a problem that requires you to draw your pistol. The sights will glow in the dark and help you make the low light shot, right? Well not exactly. The sights are light activated, meaning that they need light to actually glow in the dark. Since your gun should be riding in a holster until it needs to be used, at minimum the front sight won’t glow when you need it to, meaning this feature isn’t terribly useful for me. My opinion? Carry a flashlight and properly illuminate (and identify) your target. I ran my VP9 in context with what I use pistols for. I’m not a competitor and I don’t kick doors for a living, but I do carry a gun everyday. When I’m at home, hunting, hiking, etc, I open carry, and when I venture out of the mountains and into civilization, I carry concealed. For me, a handgun is a convenience self-defense weapon, and a backup to my rifle. My first priority when evaluating a pistol is reliability. If the gun doesn’t go bang, it’s obviously not worth much. Second, I want what is commonly referred to as practical accuracy (also known as minute of bad guy, combat accuracy, etc). Whatever you call it, I’m not bench resting at 25 yards and measuring groups. In the reliability department, my VP9 runs like a scalded Democrat chasing a bus load of illegal immigrant votes. In addition to range sessions, I ran my VP9 on day 1 of a recent carbine/pistol class I attended where it ate through about 300 rounds of mixed range ammo – some steel cased Wolf and Tula, some reloaded ammunition from Freedom Munitions, some Federal, and probably a few others mixed in that I’m not remembering. 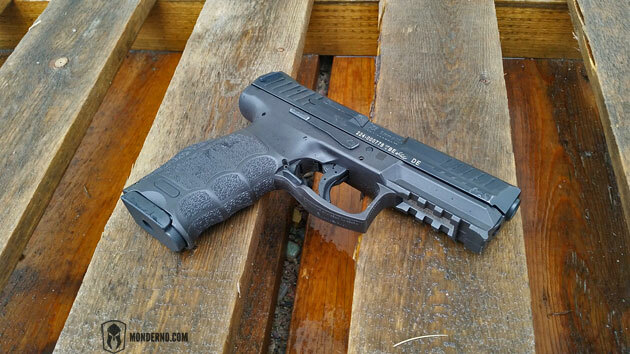 Oh and it was raining, but the VP9 didn’t seem to mind. I know this is a sample size of one, but my VP9 has been 100% reliable. Accuracy is everything I want in a pistol – I’m not the world’s greatest pistol shooter, but I can usually hit what I’m shooting at if I do my part. The great trigger and ergonomics makes it easy to shoot the VP9 accurately and quickly. Recoil is mild, as expected with 9mm, and muzzle flip is negligible. 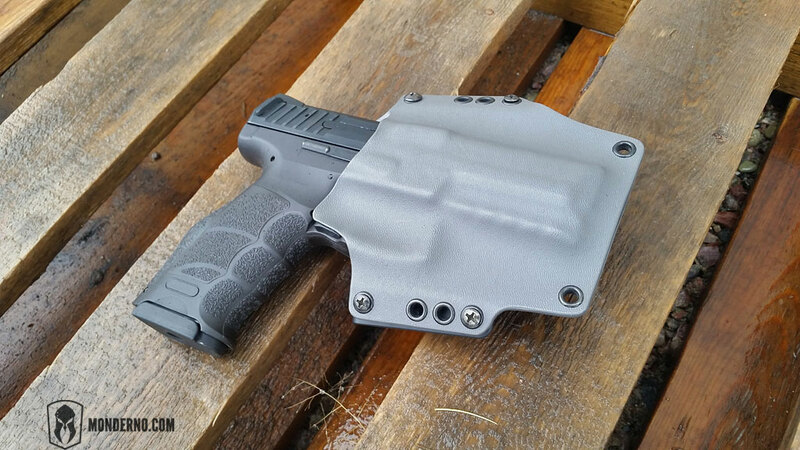 I have been carrying my VP9 in custom Kydex holsters from PerSec Systems for both open and concealed carry. PerSec holsters are fantastic, and the VP9 carries really well. It’s a bit bigger than the 15 round magazine capacity would suggest, but I didn’t have any trouble concealing it in the appendix position. Holsters are pretty much available now, and I definitely recommend checking out PerSec Systems if you’re looking for a Kydex holster. In addition to my dislike of the sights, there’s one other minor drawback to the VP9 when comparing it to the competition – the size/capacity ratio. The VP9 is essentially the same size as my Glock 17, but it has a standard capacity of 15 rounds, versus 17 rounds standard in a G17. The 15 round capacity is on par with the smaller and lighter Glock 19, but it’s substantially bigger and heavier than the G19. Compared to a Glock 17, you’re giving up 2 rounds, with a nearly identical size and weight. Compared to a Glock 19, you’re getting the same capacity but in a slightly bigger and heavier package. Not a huge issue for me, but worth mentioning. 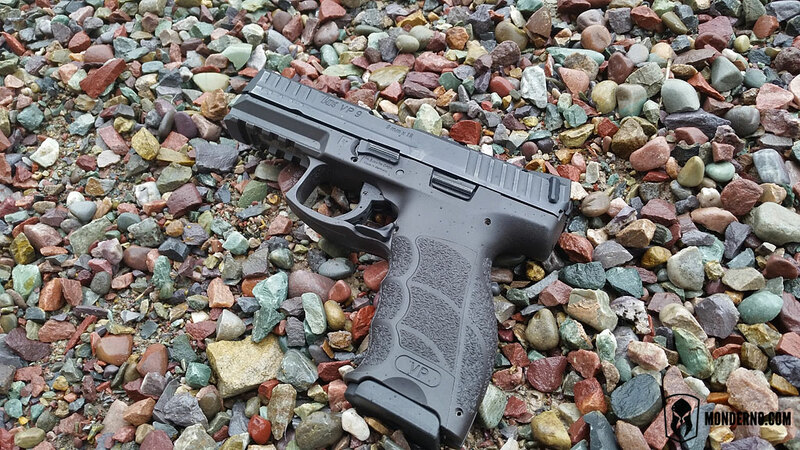 The VP9 is a fantastic pistol, but does it replace Glock for me? No, it doesn’t, for a couple reasons. First, the VP9 is currently only available in one size and one caliber, and I have several Glocks. I use a Glock 20 (10mm) for wilderness use, a Glock 17 (9mm) for classes/SHTF, a Glock 19 (9mm) for concealed carry, and I even have a little Glock 42 (380 ACP) floating around for deep concealment. The second reason is a training issue – the mag release. Glock of course uses the button style mag release, whereas the VP9 is paddle style. I just have too much muscle memory built up around the button style to make a partial switch. Having said that, if you’re in the market for a polymer, striker fired pistol, make sure the VP9 is on your short list. I’m sure there will be lots of discussion as to which is better, the VP9, PPQ, Glock, M&P, etc, but the bottom line is this: the VP9 a great gun, and if the features work for you, buy with confidence. 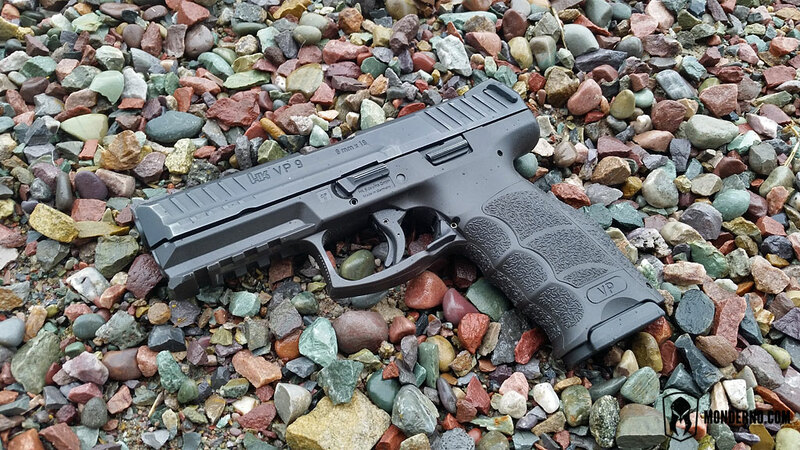 Great review – if I didn’t love my PPQ so much, I’d pick one up. Thanks Mike and I agree – the PPQ is a great gun. Great review Brandon! I’ve had my eye on the VP9 for a while and thought it was full of gimmicks… Sounds like maybe not… Thanks for the honest review! Would you ever consider doing a side by side comparison with the PPQ? I’ve wanted a VP9, but won’t buy one if all I’m getting is my PPQ with a different badge. Possibly if there’s enough interest. There are certainly many similarities between the two guns, but the VP9 is not a PPQ copy. PPQ inspired? Perhaps, I don’t know. Both are fantastic guns, go to your gun shop and take a look at them side by side. Really you can’t go wrong with either. I purchased a vp9 as my first gun and I too am happy I did. I already had 3 HK USP pistols, several Glocks, and FNX pistols. Last October I was at a local gun show I picked up a new VP9 for $615 after tax. I did buy 2 additional 15 round mags there as well for $35 each. I have to say this is an awesome pistol. So much in fact that my wife has now taken it over for range and home protection due to its ergonomics and the charging tabs. She had carple tunnel in her hands and this gun saved her from not being able to use a gun. She is now able to rack the slide back and shoot this gun very comfortably. So now that my wife is using this gun what did I do? I bought a new HK P2000 in 9mm. Now I have lots of choices to shoot. The ONLY thing I don’t like are the cheesy charging sites. I know they make a LEO version that comes with night sites and three 15 round mags though for about $125 more but it wasn’t available at the show.